Digimon Frontier (Japanese: デジモンフロンティア, Hepburn: Dejimon Furontia), known as Digimon: Digital Monsters (Season 4) in English-speaking territories, is the fourth anime television series of the Digimon franchise, produced by Toei Animation. Unlike the first three series, the main characters, the DigiDestined merge with ancient spirits known as "Legendary Warriors" to become Digimon themselves, instead of training. Like Digimon Tamers, the climax features any human fusing each partner as a Mega form. The series aired in Japan from April 7, 2002 to March 30, 2003, with an English-language version, produced by Sensation Animation, airing in North America from September 9, 2002 to July 14, 2003. It was the last season to use the Digital Monsters title as subsequent series, beginning with Digimon Data Squad and using unique localized titles. In the events prior to the series, a group of ten Digimon creatures from the "Digital World", a parallel universe originated from Earth's various communication networks, sacrificed themselves to seal Lucemon. These Digimon collectively known as "Legendary Warriors" created artifacts from their data, the twenty "Spirits" (ten Human Spirits and Beast Spirits for each elements), before leaving the Digital World in the care of three Celestial Digimon, Ophanimon, Cherubimon and Seraphimon. When Cherubimon betrays them, Ophanimon summons five children. The leader of the group. He uses the Human Spirit of Fire to become Agunimon (アグニモン) and the Beast Spirit of Fire to become BurningGreymon (ヴリトラモン, Vuritoramon, Vritramon in the Japanese version). The combined spirits allow him to transform him into EmperorGreymon (カイゼルグレイモン, Kaizerugureimon, KaiserGreymon in the Japanese version). Takuya also appeared in the third and final season of Digimon Fusion. A loner and one of Takuya's friends. He uses the Human Spirit of Light to become Lobomon (ヴォルフモン, Wuorufumon, Wolfmon in the Japanese version) and the Beast Spirit of Light to become KendoGarurumon (ガルムモン, Garumumon, Garmmon in the Japanese version). The combined spirits allow him to transform him into MagnaGarurumon (マグナガルルモン, Magunagarurumon). The only female member. She uses the Human Spirit of Wind to become Kazemon (フェアリモン, Fearimon, Fairymon in the Japanese version), and the Beast Spirit of Wind to become Zephyrmon (シューツモン, Shūtsumon, Shutumon in the Japanese version). The oldest of the group. He uses the Human Spirit of Thunder to become Beetlemon (ブリッツモン, Burittsumon, Blitzmon in the Japanese version), and the Beast Spirit of Thunder to become MetalKabuterimon (ボルグモン, Borugumon, Bolgmon in the Japanese version). The youngest of the group. He uses the Human Spirit of Ice to become Kumamon (チャックモン, Chakkumon, Chackmon in the Japanese version), and the Beast Spirit of Ice to become Korikakumon (ブリザーモン, Burizāmon, Blizzarmon in the Japanese version). Koji's older twin brother, whose existence was kept from one another after their parents' divorce. He follows Koji to the Digital World, only to be found by Cherubimon. As Cherubimon's servant, he uses a Human Spirit to transform into Duskmon (ダスクモン, Dasukumon), and a Beast Spirit to transform into Velgemon (ベルグモン, Berugumon). Once Koichi reforms, he uses the Human Spirit of Darkness to become Löwemon (レーベモン, Rēbemon), and the Beast Spirit of Darkness to become JägerLöwemon (カイザーレオモン, Kaizāreomon, KaiserLeomon in the Japanese version). The primary antagonist of the first part of the series, Cherubimon was once a benevolent ruler of the Digital World alongside Seraphimon and Ophanimon until he was corrupted to evil by Lucemon. The Digidestined are called to the Digital World to defeat Cherubimon and restore peace to the land. In a final battle with the Digidestined, Cherubimon is destroyed and purified by Takuya Kanbara as EmperorGreymon and reverts back into his old self for a few moments before dying. He is later reborn as Lopmon near the end of the series. In the final episode, the spirit of a redeemed Cherubimon appears alongside that of Seraphimon and Ophanimon to guide the Digidestined in their final battle with Lucemon. A fallen angel Digimon and the primary antagonist of the series. Lucemon was once a benevolent ruler who brought peace to the Digital World, but became corrupted by his own power and turned into a tyrant. The Ten Ancient Warriors came together to defeat Lucemon and locked him away in the core of the Digital World. Lucemon was able to corrupt Cherubimon and used him to gather the data of the Digital World so that he could be released. Revealed as the true antagonist after Cherubimon's defeat, Lucemon released the Royal Knights to finish his work. Upon his release, Lucemon proved to be more than a match for the Digidestined until Takuya and Koji formed Susanoomon and apparently destroyed Lucemon. However, Lucemon rose again, but as a being of pure evil as Susanoomon only succeeded in scanning his good data. With the encouragement of their friends, the Digidestined formed together into Susanoomon who destroyed Lucemon Shadowlord Mode. However, Lucemon Larva, which contained Lucemon's consciousness, survived and attempted a sneak attack. The spirits of the Ten Legendary Warriors emerged from Susanoomon to destroy Lucemon once and for all with the core sword of Susanoomon's cannon. With Lucemon leaving behind no DigiEgg, he was destroyed forever. Toei Animation announced the production of a fourth Digimon series in February 2002 and was set to start in April, after Tamers. Digimon Frontier was conceived by Fuji TV's Go Haruna, Yomiko Advertising's Kyōtarō Kimura, and Hiromi Seki. The series was directed by Yukio Kaizawa, who had previously worked on some Bikkuriman shows and certain One Piece episodes. It was chiefly written by Sukehiro Tomita, while character designs were done by Katsuyoshi Nakatsuru. Digimon Frontier aired in Japan on Fuji TV from April 7, 2002 to March 30, 2003. The show's opening theme song is "Fire!!" by Kōji Wada, which peaked at #75 on the Oricon Weekly Singles Chart. The ending theme songs are "Innocent ~Mujaki na Mama de~" (イノセント〜無邪気なままで〜, Inosento ~Mujaki na Mama de~) by Wada for the first half and "An Endless Tale" by Wada and AiM for the second half. The insert songs featured in the show are "With the Will" by Kōji Wada, which served as the Spirit Evolution theme, and "The Last Element" by Ayumi Miyazaki, which was the theme song for Unified Spirit Evolution. Certain scenes involving sexuality were censored for the North American release. An English-language version, produced by Sensation Animation and recorded by Studiopolis, aired in North America as the fourth season to Digimon: Digital Monsters. It aired on UPN, ABC Family, and YTV between September 9, 2002 and July 14, 2003. Digimon Frontier appeared on ABC Family as part of a package deal with Digimon Tamers from when Disney had acquired the rights from Saban Entertainment. UPN aired the show until late August 2003, when they severed their ties to Disney. The dubbed version featured an original soundtrack, sound effects, character name changes and edits pertaining to content scenes thought to be inappropriate for all audiences. The theme song of the English version was produced by Chris Horvath. In addition to the theme song, the show also featured music by Deddy Tzur and Inon Zur. The series was originally scheduled to air on Jetix in the United Kingdom. However, the series was put on hold and was never broadcast by the time the channel ended in August 2009. New Video Group released a complete DVD box set of English-dubbed Digimon Frontier on September 10, 2013 in the US, and a DVD collection with all Digimon shows up to Frontier on October 22, 2013. Out of fan requests, the UK got a release of Frontier on October 29, 2018. In addition to the television series, a film adaptation titled Digimon Frontier: Island of Lost Digimon was produced. It had the same writer, composer and character design from the TV show, but was directed by Takahiro Imamura. The film premiered at Toei's Summer Anime Fair on July 20, 2002 along with three other productions. Although the fair was deemed a box office failure, earning 800 million yen (US$6.8m)—whereas last edition earned 2 billion yen—, the film alone grossed half of it, 460 million yen. The film aired on American Jetix on November 27, 2005, and reruns were broadcast on Toon Disney in 2007. 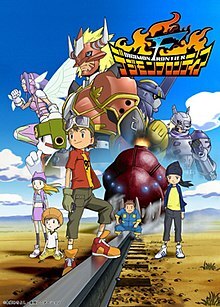 A drama CD titled Digimon Frontier: Original Story: What I Want to Tell You (デジモンフロンティア オリジナルストーリー 伝えたいこと, Dejimon Furontia: Orijinaru Sutōrī Tsutaetai Koto) was released on April 23, 2003 and is centered on each of the Legendary Warriors sending messages to each other. The cast from the television series reprised their roles. ^ Ross, Carlos. "Digimon S4: Digimon Frontier". THEM Anime Reviews. Retrieved August 19, 2018. ^ "Toei Confirms New Digimon Series". Anime News Network. February 9, 2002. Retrieved January 19, 2018. ^ "Digimon Tamers". Toei Animation. Archived from the original on March 4, 2015. Retrieved January 19, 2018. ^ "スタッフ - デジモンフロンティア" (in Japanese). Toei Animation. Retrieved January 19, 2018. ^ "Dossier Digimon -- Partie 3". Manga-News (in French). March 20, 2014. Retrieved January 19, 2018. ^ a b デジモンフロンティア. Media Arts Database (in Japanese). Agency for Cultural Affairs. Retrieved October 11, 2015. ^ Dennison, Kara (January 18, 2018). ""Digimon" Returns as Smartphone RPG". Crunchyroll. Retrieved January 19, 2018. ^ "FIRE! !（期間生産限定盤） [Limited Edition version]". Oricon (in Japanese). Retrieved 2018-11-02. ^ "イノセント～無邪気なままで～". Feel Mee (in Japanese). Retrieved 2018-11-02. ^ "an Endless tale". Oricon (in Japanese). Retrieved 2018-11-02. ^ "FIRE!!". Feel Mee (in Japanese). Retrieved 2018-11-02. ^ "The last element/Miracle Maker". Feel Mee (in Japanese). Retrieved 2018-11-02. ^ a b Erickson, Hal (2005). Television Cartoon Shows: An Illustrated Encyclopedia, 1949 Through 2003, Volume 1. McFarland & Company. p. 249. ISBN 978-0786420995. ^ "Chris Horvath: Credits". Chris Horvath. Retrieved 2018-11-04. ^ "Chris Horvath: Themes & Main Titles". Chris Horvath. Retrieved 2018-11-04. ^ James Batchelor (2017-05-18). "Inon Zur: "In video games, you don't need to hear the music - you need to feel it"". Gameindustry.biz. Retrieved 2018-11-04. ^ Green, Scott (May 23, 2014). ""Digimon Frontier" Season 4 and "Yu-Gi-Oh Classic" Season 1 Listed by Retailer". Crunchyroll. Retrieved January 19, 2018. ^ "North American Anime, Manga Releases, September 8–14". Anime News Network. September 10, 2013. Retrieved January 19, 2018. ^ "Digimon Seasons 1-4 DVD Collection (D) (Adventure/02/Tamers/Frontier)". Right Stuf. Archived from the original on May 12, 2014. Retrieved January 19, 2018. ^ "Manga UK Autumn/Winter Release Slate". Manga UK. Retrieved July 23, 2018. ^ "デジモンフロンティア　古代デジモン復活!! STAFF&CAST" (in Japanese). Toei Animation. Retrieved January 19, 2018. ^ "デジモンフロンティア　古代デジモン復活!!" (in Japanese). Toei Animation. Retrieved January 19, 2018. ^ a b "Toei Summer Anime Fair a failure". Anime News Network. August 30, 2002. Retrieved January 19, 2018. ^ "2002年度 日本映画・外国映画 業界総決算 経営/製作/配給/興行のすべて". Kinema Junpo (in Japanese): 140. February 2003. ^ "Digimon on Jetix". Anime News Network. November 1, 2005. Retrieved January 19, 2018. ^ Hanson, Brian (January 20, 2007). "January 20th - January 26th - The Click". Anime News Network. Retrieved January 19, 2018. Hanson, Brian (April 21, 2007). "April 21st - April 27th - The Click". Anime News Network. Retrieved January 19, 2018. Hanson, Brian (September 22, 2007). "September 22–28 - The Click". Anime News Network. Retrieved January 19, 2018. ^ "デジモンフロンティア オリジナルストーリー 伝えたいこと". Feel Mee (in Japanese). Retrieved 2018-11-02. This page was last edited on 2 April 2019, at 19:11 (UTC).